First, read John MacArthur’s latest piledriver of the SJW (Social Justice Warrior) antigospel here, then read and sign the Statement on Social Justice and the Gospel. You know what? Focusing on the racially-obsessed sect of American evangelicalism is starting to smell like a real satanic strategy to me. People like Kyle James Howard are drawing far too much of our attention and energy, when there are 1,001 more urgent uses of our resources. For a while I’ve poured a lot of my energy into interacting with, deriding, rebuking, admonishing, and refuting the SJW sect within American evangelicalism. Why? They’re dead-set in their doctrines of privilege & power differentials. They are apostatizing from the faith once for all delivered to the saints, and shifting the focus of Christianity to a theology of glory. In this iteration, the glory goal isn’t so much personal life fulfillment & self actualization as it is a forceful equalizing of outcomes. Evangelical SJWs are theologians of glory. They’re not prosperity hucksters for money, but they are equality hucksters. The equality they preach is not a type that Christ promised we could create, or even should create. But it’s all a very emotionally-charged sleight of hand. We all know there is a type of equality that the gospel creates: all equally forgiven & justified. All accepted & adopted, regardless of background or whatever else. Our life in the church should reflect that. Church should be about reflecting the equality of how we are loved by Jesus. Yet being a part of the church’s life cannot make true forms of inequality or hierarchy that are baked into human society suddenly not exist or impact our relationships. I began my previous post speaking of disillusionment with the local church. As a young Christian, I believed that the better the doctrine a church teaches, the better the fellowship and spiritual health of the congregation would have been. Our experience up through 2011 showed this not to be so; although our church at the time was filled with lovely people (and still is), the good doctrine alone never seemed to assure deep bonds of fellowship or friendship—no blame assigned, at least, it would be self-destructive to keep rehashing my perception of how this person or that person let me down, or let Danielle down, or how we let this one or that one down. There comes a point in the healthy Christian life where, for the sake of love, one must simply let go of the possibilities of how we have brought harm to one another. Yet since fellowship and friendship are indispensable parts of living the Christian life, this meant we were very lonely, even in rooms full of people. We left ECF embarrassed for our weaknesses and mistakes, having lost the few bonds we made with our church family there. It had become painful to show up to church, always seeking to avoid certain people in small rooms where everyone sees everyone. I have been absolutely destroyed for time lately, as life with my newborn has been anything but easy. I also have 4 jobs outside of the podcast, so I am barely treading water. The podcast is overdue, and the spiritual autobiography is overdue, but I have not quit, nor forgotten these things. Pray for me. 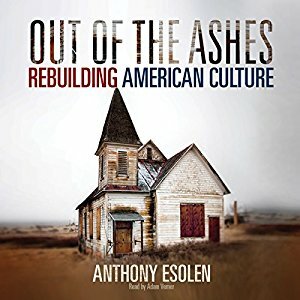 In the meantime, I recently listened to the audiobook version of Anthony Esolen’s Out of the Ashes: Rebuilding American Culture, and would highly recommend it to you. Esolen is one of those ultra-talented commentators who understands the relationship between the physical and metaphysical in such a way that he draws you inward and upward as you read. Very worth it. Buckle up for a longer post this time. I have to mention all the events and people included here, and I don’t feel like artificially breaking this up into separate posts, mostly because I have a lot to cover, and I’m not trying to tailor this series to a popular audience. When one wishes to blog like a champion, one must observe the rule to keep posts short, so as not to lose the interest of the average reader. Since I do not have many readers, nor average readers, I am writing at length today. Upon returning home from Yellowstone National Park in 2005, I continued working toward my Bachelor degree at SUNY Brockport, leading Campus Crusade for Christ (CC4C) on campus, and practicing evangelism with my mentors Peter and Phillip. So far in this series I’ve hovered in the years 2004-2007, because so much of what happened in those years led me to where I am today. And where am I today, spiritually and doctrinally? (I want to keep within eyesight where this series is going so you can follow along better). I’m a catholic, orthodox Protestant, but with a very troubled faith in some regards. I have been looking for the Church catholic for 15 years now, and am feeling a bit lost in the woods. The reason this prompted my writing is because I can’t seem to find where I am, spiritually and ecclesially (that would mean in reference to the Church catholic). I know I am in the Body of Christ; I know I am a part of the universal Church, but translating that into concrete worship and service in a local church has proven frustrating.